On this fantastic trip from Trieste to Pula you will witness the cultural diversity and richness of the Istrian Peninsula. Trieste and Pula were once harbour centres of Austria-Hungarian empire, Poreč and Rovinj were important trade centres in Roman Empire; Motovun and Grožnjan were typical medieval fortified hilltop towns. Vineyards, olive groves will fallow you during the cycling trip in region where truffles are domestic food, along with many other specialities which you can enjoy at the end of cycling day. Trieste (Italy): Trieste is the capital city of the Friuli Venezia Giulia region in northeast Italy. A port city which occupies a thin strip of land between the Adriatic coast and Slovenia’s border on the limestone-dominated Karst Plateau. Piran (Slovenia): Piran is a resort city on Slovenia’s Adriatic coast, known for its long pier and Venetian architecture. Motovun: Motovun is a picturesque medieval Istrian town, a frequent motif on postcards representing Green Istria. Poreč: the Euphrasius basilica (UNESCO). Pula: The city is situated on seven hills with a magnificent Amphitheatre. Independent arrival in Trieste. The remainder of the day is at leisure to explore Trieste. Overnight in Trieste. At 09 am we have a welcome briefing and those who have ordered bike rental will get fitted with our bikes and other equipment. Your cycling adventure through 3 countries (Italy, Slovenia and Croatia) you will start riding on the legendary route of the Parenzana, the former narrow-gauge railway line which penetrates deeply into the Istrian peninsula connecting 33 Istrian cities and town from Trieste do the Poreč (in Italian Parenzo from which the rail road got it's name) spanning to the territory of three states. Although it has been out of function for many decades, a few years ago the Parenzana served as the inspiration for a new tourist attraction. The County of Istria, the Management Board for Tourism and the Association for the Renovation of the Poreč-Kopar-Trieste railway started the important “Parenzana: The trail of health and friendship” project, where they have promoted the former railway as a cycling path. After a few miles through the city of Trieste we will cross over into Slovenia, often cycling along cycle paths through famous holiday resorts such as Koper, first for a long period a Venetian and then Austrian town, and Piran, another important town which was ruled over for a long time by Venice. Cycling southwards, you will pass through the salt mines of Secovlje, a large Slovenian town with a humid environment, which is a key area as regards ornithology. Some miles later we will cross the Croatian border down along Istria, the Adriatic sea’s largest peninsula. Overnight in Buje area. 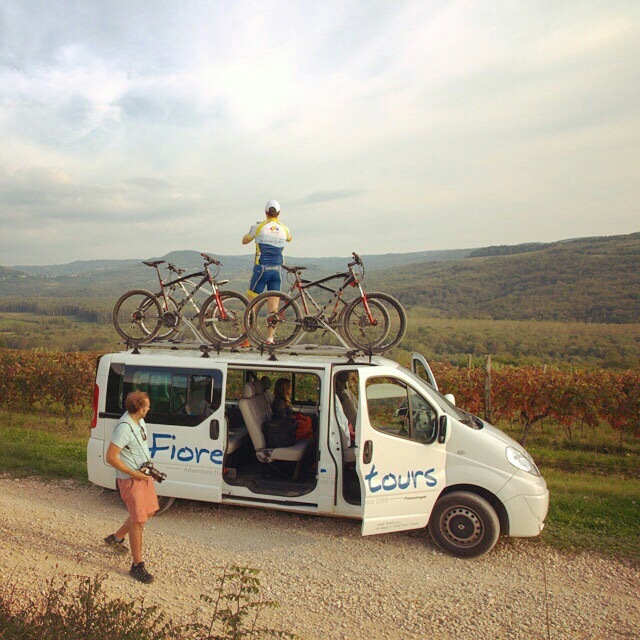 This tour starts with easy downhill ride to the coast on the northest point of Istrian peninsula. There is a lighthouse which you can visit, according to the legend build by count Metternich as his love nest. Savudrija is one of the oldest lighthouse in the Adriatic, built in 1818. It is also the northernmost Istrian lighthouse. Its building is 36 meters tall and there is a keeper living inside it. The trail continues south to Umag. About 45 km down the route, along the coastline and interesting hinterland integrates special features of the whole region and might be the best introduction into a different experience of the Mediterranean. Umag's history is extremely interesting - it was founded by Roman nobleman to be his summer residence. The glamour, magnificence and glare of the times can be seen today in the Venetian houses of the old town. City walls and fortification are partially preserved as well as some renaissance and baroque buildings and churches. 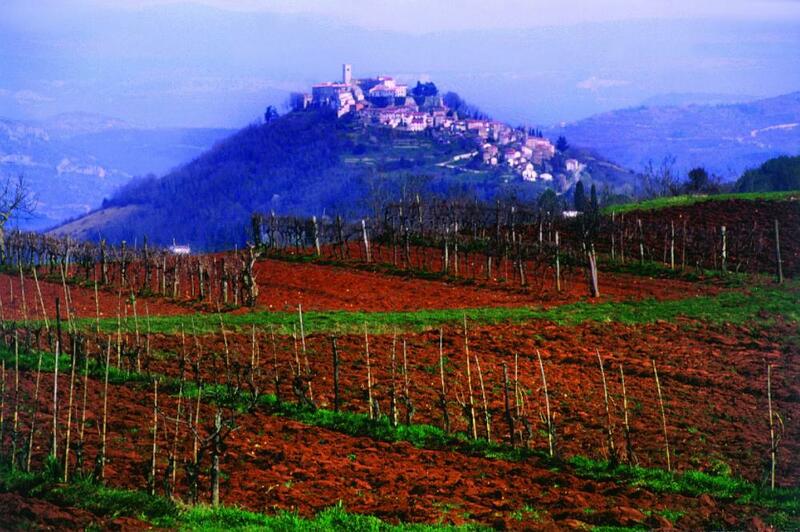 Vineyards and olive groves will create an atmosphere of typical west Istrian landscape. Visit a wine cellar to taste the muscat, local sort of wine! Overnight in Buje area. Breakfast, apart from enjoying the breathtaking landscape of the terrace - styled vineyards which resemble to an image on the front page of a holiday guide to Tuscany, you can indulge the sensation the area of Buje gives, a real polyphony of fragrances and tastes. Riding through magnificent rolling landscapes and lively Istrian vineyards, it will become obvious why it was once known as a wine railway. After passing through many tunnels, over old bridges we will stop by many fascinating view points from charming medieval town of Grožnjan to Završje until we reach Motovun, a historical heritage site, an ancient little Istrian town located atop a 277-meter-high hill, 21 km southeast from Buje. Its present appearance with the city walls surrounding the centre of the town dates back to the Middle Ages. After breakfast we continue riding on Parenzana trail over Vižinada and Kaštelir to the coast. The ride towards Poreč is particularly pleasant because you are riding along the coastline with beautiful bays where you can enjoy the breathtaking Mediterranean landscape with green vineyards and olive groves and taste home made food, wine, brandy and honey produced in this area. In afternoon hours we reach Poreč, the town where you can find material and spiritual evidences of great cultures at every step. Cruise along the old city centre and see the old Roman forum, the world famous Euphrasian Basilica with it's mosaics, palaces belonging to the city nobles and fortifications. Overnight in Poreč area. Breakfast. A marsh, rare birds, a cursed city, buried pirates treasure, a depp bay, a cave with a primitive man and a hermit, an ancient solar observatory, an abandoned monastery - all this you can find on our bike trail of Captain Morgan. After riding along the coastline we reach Vrsar, romantic fishing town situated on a hill where the famous Casanova came back even two times. Our bike ride we continue through the magical forest Kontija with a panoramic view of the beautiful landscape of the Lim bay to ruins of the medieval town Dvigrad. Just to stir your imagination - you are now in an area where many legends and mysteries based on historical events still live on: that of Dvigrad devastated by the plague because of an ancient curse, of the buried treasure of Captain Morgan's pirates near the village named after him (Mrgani), of the cave where the remains of the primitive man were found and where, as legend has it, St. Romuald used to live as a hermit in the Middle Ages. Passing Kanfanar and the hill Maklavun, an astral-archaeological site – tumulus from the Bronze Age we will finish this day in Rovinj. Called also little Venice, Rovinj is a typical Mediterranean seaside resort which will seduce you with its extraordinary beauty. In the dense tissue of the old city centre, there are numerous magnificent palaces from different historical periods and today most of them host a gallery or an art studio. If you follow numerous chimneys of Rovinj and narrow meandering streets you will come in front of the baroque church of St Eufemia, the greatest monument in the city from which you can admire a magnificent view of the Mediterranean almost in your hand palm. Overnight in Rovinja area. After breakfast we start riding along the coastline towards Pula. Riding through the ornithological reserve Palud with rich variety of ornithology-fauna, a unique place where you can hear the chirping of even 215 different bird species we reach Fažana, Situated on a low coast, well protected from the open sea by the enchanting Brioni archipelago (nowadays a national park) and surrounded by vineyards and olive groves in the hinterland, Fažana was well known already in ancient Roman times. Which city is situated on seven hills, has a magnificent Amphitheatre and is not Rome? The answer is - Pula. 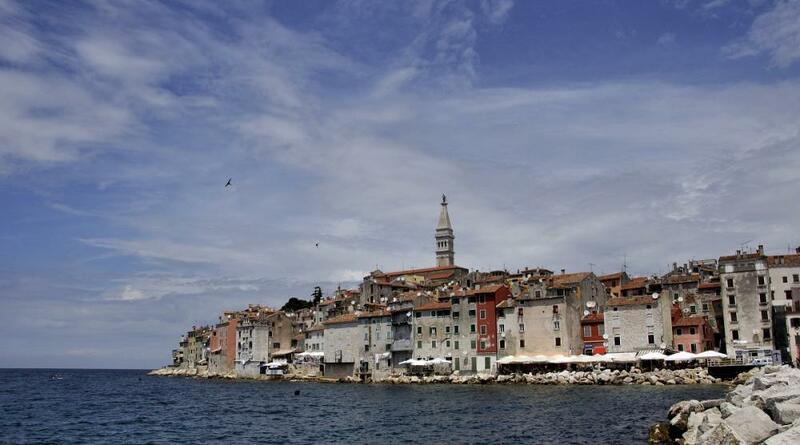 No, it is not a mistake – you are, indeed, in front of Pula, the largest city in Istria. Pula is an enchantress with thousand appearances which has been casting spell on its visitors for centuries. This day we finish visiting the old city with the Sergius' Triumphal Arch (from the end of the 1st century B.C. and the beginning of the 1st century A.D.) and famous Arena, a Roman amphitheatre (from the 1st century B.C.). Overnight in Pula area.